For the last couple of months, I have been working with the offering for implementing monitoring services for workloads that are running on Azure, and based on my experience there are few different monitoring solutions available from Azure, and each has specific purpose and benefits. For the benefit of everyone, I thought of summarising my findings in this post and share it with you all here. Hope it helps. Why monitor your cloud application? Before we proceed further, let’s start with the basics, why monitor a cloud application? Monitoring provides data to ensure that your application runs in a healthy state. It protects you from potential problems. Also, you can use monitoring data to gain deep insights into your application. These insights and knowledge help you to improve application performance or maintainability, or automate actions taking out the need for manual intervention. 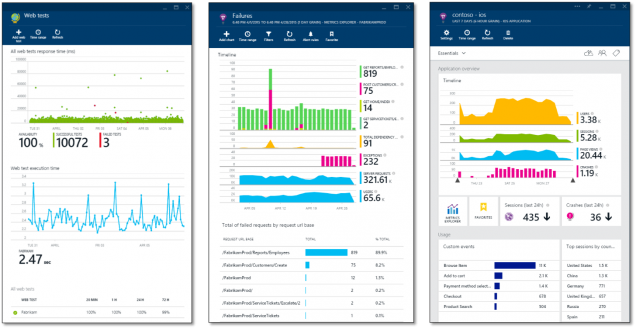 Now, let’s look at the bigger picture of end-to-end monitoring services that Azure provides. Application Insights is used for development and production monitoring. The data coming out of this service includes response times of de-pendencies, exception traces, debugging snapshots, execution profiles. It has some powerful, intelligent, smart tools for analyzing all this teleme-try assisting you to debug an app and also helps to understand what users are doing with it. You can tell whether a spike in response times is due to something in an app, or some external resourcing issue. Any application fault can be fixed with the help of visual studio which takes you right to the code having a problem so you can fix it. Pricing: Application Insights offers two pricing options, Basic and Enterprise. For Basic, charges are per the volume of telemetry application sends, with a 1 GB monthly free allowance. The free data allowance offers an opportunity to try out Application Insights, and You may use the same for free on an ongoing basis for debugging and low-volume applications. OMS (Operations Management Suite) Service Map automatically discovers application components on Windows and Linux systems and maps the communication between services. The capability enables you to view the connections affecting your systems, and better understand the relationships between the different components of your distributed applications. Service Map helps you view your servers as interconnected sys-tems delivering critical services. Service Map display connections between servers, processes, and ports across any TCP-connected architecture, with no configuration, required except the installation of an agent. Pricing: Service map available in Insight & Analytics OMS Stand-alone solution package. Gives an option to buy as a standalone package or as OMS subscription (E1/E2). OMS Log Analytics allows you to tune performance and plan maintenance on applications running in production. The log analytics collects and aggregates data from many sources, with a maximum delay of 10 to 15 minutes. It is a holistic IT management solution for Azure, on-premises, and third-party cloud-based infrastructure like AWS. It provides versatile tools to analyze data across multiple sources, allows complex queries across all logs, and can alert proactively on specified conditions. You can even collect custom data in the central repository for querying and visualizing it later. The above image of Azure login one of the instance. Pricing: Same as OMS Service Map, log Analytics is part of Insight & Analytics OMS Stand-alone solution package. It helps you monitor the near real-time monitoring of network performance parameters (such as packet loss and network latency) and localize network faults and also detect network performance bottlenecks if any. You can monitor the latency between two networks, subnets or servers With the Network Performance Monitor solution. Solution dashboard helps you detect network issues which display summarized information about the network including recent network health events, weak network links, and subnetwork links that are facing high packet loss and latency. Pricing: Same as OMS Service Map, network Performance monitor, is part of Insight & Analytics OMS Solution package. Azure Monitor is the primary tool for monitoring services running on Azure. It gives infrastructure-level data about the throughput of a service and the surrounding environment. It collects granular performance and utilization data, activity and diagnostics logs, and notifications from your Azure resources. If Azure is being used for managing all your resources; then Azure Monitor can help you in deciding on scaling up or down re-sources. Pricing: There are no charges for Metric Queries as of today. For more info on pricing, please check out the Microsoft website. Azure Advisor works as a personalized cloud consultant that ensures that best practices are followed to optimize your Azure deployments. It analyses your current resource configuration and usage telemetry and then recommends solutions based on high availability, cost, security, and performance. Azure Advisor provides an impact evaluation, problem description, resource, and update information. Pricing: Azure Advisor is a free service. For more info, you can refer to Microsoft website. I hope this would have given you an overview of what monitoring services available on Azure and where and when to use them. If you find this useful, please feel free to share this with others.